Mike began his legal career with Heyl Royster in the firm's Urbana office in 1982 after serving as law clerk for the Honorable Henry Wise, United States District Court for the Central District of Illinois. 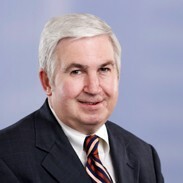 Mike became a partner with the firm in 1990. Mike concentrates his practice in the areas of automobile liability, premises liability, medical and legal malpractice claims, products liability, and toxic exposure. He also practices in the area of creditors' rights in the context of lien adjudication. In addition, he has handled insurance coverage questions as well as uninsured motorist arbitrations.